Hey, Frontier Facebook fans: we really, really like you. Every time we ask you for suggestions and ideas, you come through with excellent combinations and uses for our products that we love to learn about. Just plain old sweet tea with a lemon, from a Mason jar, of course! Black with raspberry herbal. Green with citrus. Double Bergamot Earl Grey. Just good cold well water! Frontier Raspberry green tea makes a WONDERFUL sun tea! Frontier Spiced Chai steeped, cooled, iced with a little half and half. Yummy! I make all sorts of sun tea…anything from a mixture of my herbs to tea bags…I love it all. I go thru a gallon every 2 days! I make sun tea about every other day, 2 half gallons: one, black or a mix of black & green, for sweet tea; and the other, either just peppermint or a mix of green tea, roses, cinnamon and peppercorns. Peppermint tea, with leaves fresh from my yard. Raspberry and just plain old green tea. I sweeten w/stevia or honey. Orange and blueberry are a lovely combination. I’m diabetic, so I sweeten with Splenda or Truvia. 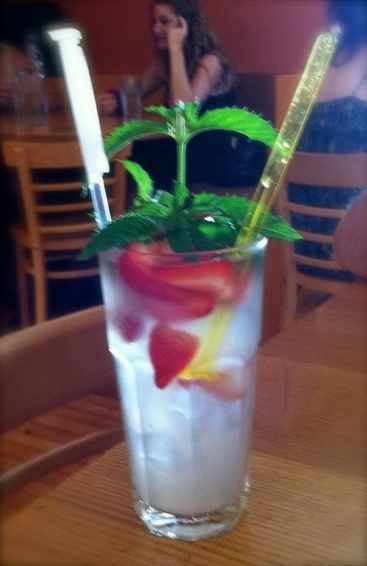 Speaking of mint tea, it’s hard to beat as a drink to help cool you down on a sizzling summer day. Try this easy recipe for making your own, combined with juicy strawberries and lemon, for added sweetness. Mix the lemon, water, and sugar to create lemonade to taste. Mix with your sun tea. Pour into 16 oz glass. Finish with slice of lemon and straw. Let us know your favorite summer teas! More on herbal summer teas on our website. Many of our customers tell us their favorite product from our company is our tea. In fact, one of our customers loved the Earl Grey tea her local cafe served, so she asked them what kind it was. No one working there would tell her, saying it was their special blend. As she was leaving, another patron said, “It’s Frontier. I used to work here, I know. ” She ordered from us, and began enjoying her favorite Earl Grey cup of tea at home, too. The traditions and rituals of tea date back to at least 2737 B.C. in ancient China. A popular myth claims that tea was born when a Chinese emperor and herbalist was boiling water and leaves from a nearby tree fell into the water. He discovered that when the leaves were infused in hot water, the beverage created was delicious. The Chinese then went on to explore what they referred to as “tea mind” — a calm, yet alert state they achieved when drinking this concoction. This exploration continues today — amazingly, tea is the second most widely-consumed beverage in the world, only behind water. Tasting tea has become an art form, as well as, in some cases, a science. There are so many kinds of tea available today that some newcomers might be overwhelmed by what to try first. One consistent fact is that all tea comes from the same species of plant, Camellia sinensis. (Other plants are infused like tea leaves but are technically tisanes, not true teas.) The variances arise because different varieties are grown in different places and in different ways, different plant parts are used (leaves, leaf buds, and internodes) and there are different processing methods. But in all cases, the aromatic beverage that results when the cured leaves are combined with hot or boiling water is what tea drinkers celebrate. The state of mind many tea drinkers cultivate is to relax, slow down and “appreciate the moment.” Finding the right tea for that moment starts with a basic understanding of the main types of tea. By trying different kinds of tea you will be able to decide what you like best for different occasions. You might want to buy small quantities of a tea to sample it before buying a large amount. Buying bulk tea offers you this opportunity – as well as the highest quality tea, since tea bags usually contain siftings from leaves. Black teas are produced by withering, rolling and drying fresh tea leaves. This process oxidizes the leaf and allows many unique aroma and flavor elements to form. The robustness of black tea lends itself to the addition of sugar, honey, lemon, cream and milk. 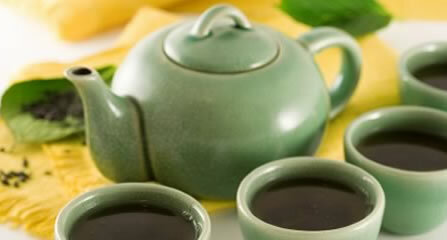 While black teas have more caffeine than green or white teas, they still have considerably less than a cup of coffee. Chai is a special flavored tea beverage created in India. Traditional chai is a strong black tea infused with aromatic Indian spices, including black pepper, cinnamon, cardamom and others. Most chai teas contain caffeine levels similar to black tea. Green tea is uncured and possesses fresh, grassy, vegetal flavors due to its unique processing. Green tea leaves are plucked, withered, rolled and dried before any curing or oxidation takes place. Green teas have the least caffeine – and the highest levels of beneficial antioxidants — of all true teas (Camellia sinensis). Oolong is only partially oxidized after the fresh leaves are plucked and withered. Before the leaves are fully cured, a quick drying preserves the flavor and aroma elements of the green leaf and combines them with black tea characteristics that arise from the partial curing. Oolong has slightly less caffeine than black tea, but slightly more than green teas. White tea is made from the very young, unfurled leaf tips of Camellia sinensis. The delicate young leaves and buds are covered with soft, silvery white hairs…thus “white” tea. White teas are generally uncured in the style of green teas and are similarly very low in caffeine. Herbal Teas (Tisanes) are beverages brewed from herbs (or combinations of herbs) other than Camellia sinensis. The herbs are blended to create unique flavors and/or desired health benefits. Herbal teas do not contain caffeine and offer their own opportunities for achieving the “tea mind.” These teas can be refreshing, calming, invigorating– or simply a delight to the senses. • Make sure your tea has been properly stored. The best way to store tea is in an airtight container, at a constant temperature, away from light, moisture, and other odors. Once exposed to air, tea leaves quickly lose flavor. Keep bulk teas in a large container, and use a smaller one for daily tea use, so you don’t have to keep opening the large container. • Use fresh, cool, oxygenated water. Never use tepid, long-standing, pre-heated or hot tap water. • Heat the water and pour it directly over the leaves. (Use about one teaspoon of tea per cup.) For green teas, heat it to the point where bubbles just begin to form. For oolong teas, heat the water until the bubbles start to release and it is beginning to boil. For black tea, allow the water to come to a gentle boil. • Steep the tea in an infuser — about three to four minutes for green tea and four to five minutes for oolong and black tea. Don’t overpack the infuser so the leaves have enough room to unfurl completely. Or simply steep the loose leaves and then pour the brewed tea through a strainer into a serving cup. • Perfect tea is brewed one cup at a time. Personal tastes, vary, of course — you’ll want to adjust the measurements and brewing times according to your own preferences. Bedouins have their own special blends of teas that they make from the dried leaves of various desert plants. On special occasions, they mix the leaves from those plants with other spices. Many tourists have tea with the Bedouins they meet and then buy the blends to take home as a reminder of their amazing experiences. Bedouin tea is quite expensive because it is scarce. In the United States, dried thyme or sage can be substituted for the Bedouin tea. Heat 4 1/2 cups water, Bedouin tea, dried rosebuds, cinnamon stick, and loose black tea in a teapot or saucepan over high heat. Once the water boils, reduce heat to low and simmer for 5 minutes. Turn off heat, and steep the tea, covered, for 5 minutes. Strain into tea cups and sweeten with sugar, if desired. What’s your favorite tea ritual? Please share.